Madrid (AFP) - As 12 Catalan separatist leaders prepare to go on trial in Madrid, Spain has been forced to defend the independence and impartiality of its courts. Catalan separatists have dismissed the high-profile trial which begins Tuesday at Spain's Supreme Court as a "farce" whose outcome is already pre-determined. Not so, says the government, which has published a thick file to show Spain's justice system is just as fair as its European counterparts, citing rankings by the European Commission, the European Court of Human Rights and Transparency International. Supreme Court President Carlos Lesmes points out that if the justice system really was not independent, the king's brother-in-law would not be in jail for corruption, nor would a court ruling have sparked a no-confidence motion that brought down the conservative government in June. "I think this will be the most important trial we've had in democracy," he told reporters before the start of the trial. "It's a challenge because there's been a big smear campaign of Spain's judiciary." Spain has had a long-standing public perception that its judiciary is biased. In the EU's 2018 "Justice Scoreboard", Spain came sixth to last among 28 member states for public perception of the independence of judges and courts, behind Poland and Hungary. Despite repeated denials, the conservative government in power at the time of Catalonia's attempt to break from Spain in October 2017 and the Socialists that took power in June have each been accused of exerting pressure on judges. "It is the state which will end up in the dock," one of the main defendants on trial, former Catalan vice president Oriol Junqueras, predicted from pre-trial detention. Junqueras and 11 others are on trial for their role in the attempt to break from Spain. Separatists call them "political prisoners" who are suffering oppression of the kind experienced in Spain during Francisco Franco's 1939-75 dictatorship. In a ruling, Spain's Supreme Court said the group were not on trial for their ideas. The majority of the defendants were "political leaders who were members of the government of an autonomous region and therefore the highest representatives of the (Spanish) state in Catalonia", it said. Public prosecutors accuse nine of the 12 of rebellion, which implies the use of violence -- a key charge which has divided Spanish legal experts. This has led conservative opposition parties, which take a hard line against Catalan separatism, to accuse the government of "unacceptable interference" in the case. They suspect the move was part of a bid by Prime Minister Pedro Sanchez's minority government to win the much-needed support in parliament of Catalan separatist parties for its 2019 budget. Justice Minister Dolores Delgado, though, said Spain's new state attorney took the decision "without the government imposing anything". In November, a conservative senator, Ignacio Cosido, also contributed to perception that the judiciary is biased. On WhatsApp, he welcomed the promotion of Manuel Marchena -- a judge seen as close to the conservatives who will be presiding at the separatists' trial -- at the head of the Supreme Court. Cosido said it would allow the conservatives to "control" the court "behind the scenes." After the controversy this generated, Marchena gave up the promotion. Courts in Belgium, Germany and Switzerland have also contributed to doubts about Spain's legal system by refusing to extradite separatists who had escaped after the declaration of independence. A German court for instance last year refused to send former Catalan leader Carles Puigdemont back to Spain on rebellion charges. 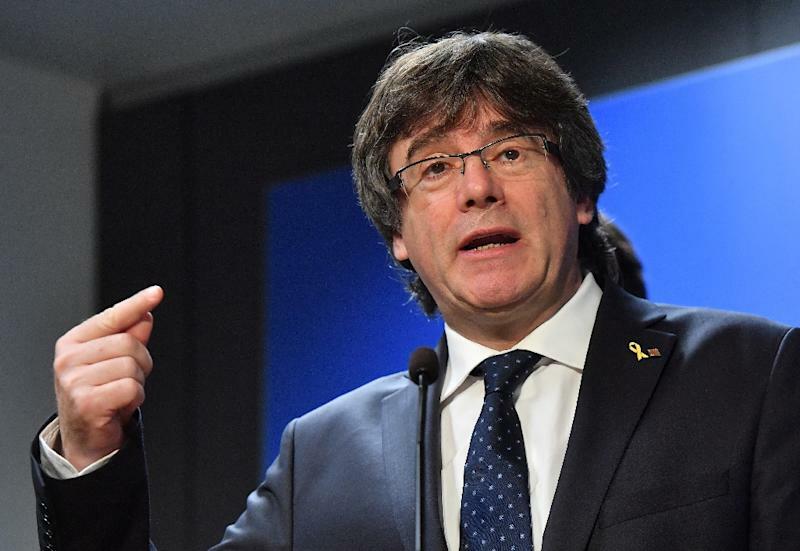 A Belgian court meanwhile has agreed to consider a civil lawsuit filed by Puigdemont's lawyers against Supreme Court judge Pablo Llarena, accusing him of impartiality in the case against the Catalan separatist leaders. Spain has not publicly criticised these decisions. "Our best communication campaign will be the trial," said Lesmes.